The National Institutes of Health has no system in place to track which federal facilities are receiving taxpayer dollars. A Freedom of Information Act request obtained by the Washington Free Beacon revealed that the health agency, which has a budget of over $30 billion, does not keep track of government agencies that receive funding. White Coat Waste, a nonprofit organization that conducts oversight over the NIH's animal research spending, requested a list of federal facilities that currently have approval to experiment on animals. In order to receive federal funding from the Public Health Service, institutions must apply for an Animal Welfare Assurance showing they will comply with the Animal Welfare Act. Institutions with active assurances receive federal funds to conduct research on live animals. More than 1,200 institutions have active assurances on file. The list includes federal animal laboratories operated by the Veterans Affairs administration, the Department of Defense, NIH, the Centers for Disease Control, the Food and Drug Administration, the U.S. Department of Agriculture, and the Environmental Protection Agency. White Coat Waste filed a FOIA request seeking a list of all federal agencies that are currently receiving funding from NIH to conduct animal experiments. The group asked for the "most recent ‘facility and species inventories' submitted by all federal facilities that have active PHS Assurances." In a response to the group, the NIH said it had no way of determining what other federal facilities they are giving taxpayer dollars to. "I have been informed by [the Office of Laboratory Animal Welfare] OLAW that they do not have a mechanism to determine if an institution is the type requested, i.e. a federal facility," wrote Margaret Snyder, the FOIA coordinator for the NIH's Office of Extramural Research. "All domestic institutions are posted at the OLAW website http://grants.nih.gov/grants/olaw/assurance/300index.htm and are available for your review." "Taxpayers have long been skeptical that the government knows how it’s spending their hard-earned money," said Anthony Bellotti, president and co-founder of the White Coat Waste Project. "NIH seems determined to prove them right with its admission that it doesn’t even have a clue which of its fellow federal agencies are getting a cut of the estimated $12 billion a year it spends on animal experiments." Request for comment from the NIH was not returned. 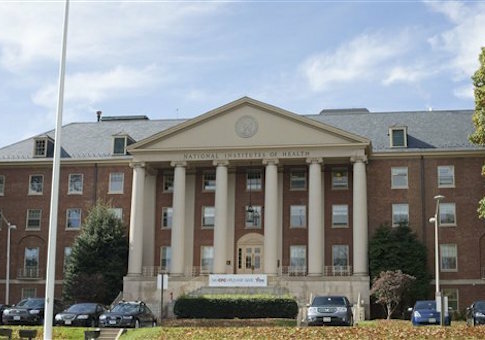 The NIH itself has expressed concern over wasting federal funding. In an issue of its monthly newsletter this summer, the agency said as much as 87.5 percent of biomedical research "may be wasteful and inefficient."